Check out the latest feature about our “Pleasurable Troublemakers” at fastcodesign.com. Some weeks ago Matthias talked to Eric Jaffe, who is a New York City based writer. To cut a long story short, check it out yourself. Based on our Note at CHI’12, The Chocolate Machine arouses some interest. Marc talked to Drake Bennett of BloombergBusinessweek. Additionally, Tim Manners of Reveries.com posted an short note about the Chocolate Machine. Additionally The Food Chanel posted some lines about the Chocolate Machine. Do/Panik – a student project by Tobias Ellinger and Philip Oettershagen – seduces its user to tidy up the desk. 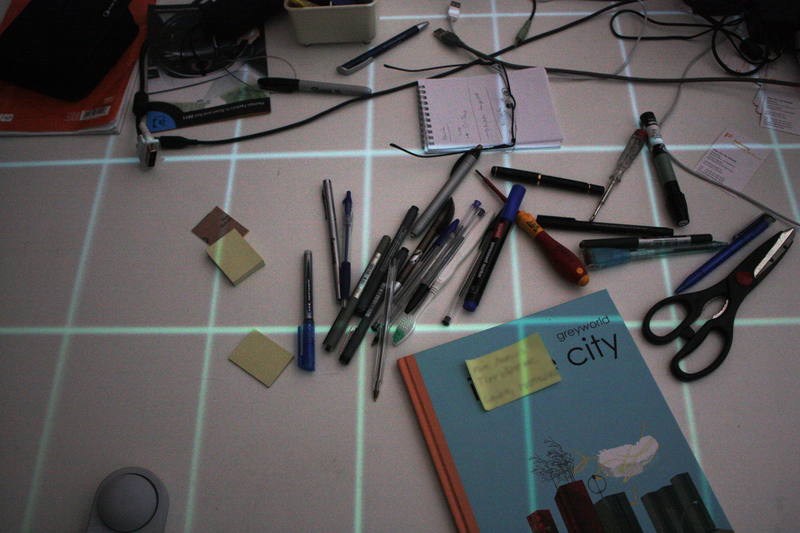 To do so it offers a variety of modes – grids, regions – projected on the desk to stimulate order. But it also acknowledges our imperfection: a panic button just hides the mess when it getsoverwhelming. Do/Panik suggests that tidying up is not only a chore, but fulfills an important psychological need for security.